Looking for the Hidden Chicago 2 website? You'll find it at wttw.com/hiddenchicago2. Q: Where will you find an actual ticket booth from the World's Columbian Exposition of 1893? A: In the back yard of a Frank Lloyd Wright home in Oak Park. It was moved there after the fair for use as a children's playhouse and later became a garden shed. Q: Where is the monument that Benito Mussolini gave to Chicago? A: Along the Lakefront - just east of Soldier Field on the site of the 1933 World's Fair. It's a 2000 year old Roman column commemorating the arrival at the fair of a fleet of Italian seaplanes under the command of General Italo Balbo. Q: Is there really a cowpath among the skyscrapers in the Loop? A: There were no cows living in the loop when the highrise building at 100 W. Monroe was constructed in 1928. But a passageway through the building was left open anyway because the deed required it. It was part of a strip of land that a farmer named William Jones retained for his use when he sold this land in 1840. According to newspaper accounts Jones wanted to be sure he still had a way to walk his cows to pasture. Q: What's that metal blob hiding in the bushes behind the Chicago History Museum? A: It's all that's left of a storefront that melted in the Great Chicago Fire of 1871. Q: Where was the first movie version of "The Wizard of Oz" filmed? A: At Selig Studios located at the corner of Byron and Claremont on Chicago’s North Side. The yellow brick structure is now used for condominiums. Chicago was the silent movie capital of America before the industry moved to Hollywood. Another studio, Essanay is also still standing. Charlie Chaplin, Gloria Swanson and others worked there. It's now St. Augustine College in the Uptown neighborhood. Q: Why is there a mural behind the clutter in the manager's office at Meyer's Ace Hardware in Bronzeville? A: This building once housed one of Louis Armstrong's favorite jazz clubs, the Sunset Café. The mural decorated the back wall of the stage, which is now the store manager's office. Chicago has the biggest collection of historic murals in America. They're in schools, post offices, park district field houses and other public buildings. After decades of neglect most have been spectacularly restored. You find them all over Chicago – painted ads for products and businesses that no longer exist. Sometimes these relics are unearthed in like-new condition when an adjacent building is demolished. Each one tells a story about our history. Find out why streets within the same mile on the Northwest Side all begin with the same letter of the alphabet. Discover an alley in the Gold Coast still paved with century old wood blocks. Meet Chicago's last elevator operators and bowling alley pinsetters. Workers digging in Lincoln Park, the Gold Coast and the Magnificent Mile periodically unearth bodies. Evidence of a past crime? No. These popular places were cemeteries in early Chicago. We'll show you a huge truss bridge over the Metra track west of the Loop that connects to… nothing! It was part of a now-defunct "L" line that served the West Side. We also follow another "L" line on the South Side that's still standing even though it shut down half a century ago. Hidden Chicago is an original production of WTTW11. Host /writer is Geoffrey Baer; Produced by Geoffrey Baer and Dan Protess; Associate Producers are Susan Godfrey and Kathleen M. Singleton; Researcher is Susan Godfrey; Executive Producer is VJ McAleer. Hidden Chicago was produced in association with the Chicago History Museum. Major funding for Hidden Chicago is provided by Harris. Additional funding is provided through the generous support of Peter Kelliher Jr. and Diane Kelliher and the Walter E. Heller Foundation in memory of Alyce DeCosta. Hunting for even more? Here's a link to a website for true Hidden Chicago aficionados: www.forgottenchicago.com. Geoffrey Baer, host and writer of Hidden Chicago with a recently restored mural at Pulaski Park Field House, 1419 W. Blackhawk St., Chicago. A detail of the mural surrounding the stage at Pulaski Park Field House, 1419 W. Blackhawk St., Chicago. Art Institute student James G. Gilbert won a competition to design it in the early 1920s. He got a hundred dollars in prize money and $200 to cover his costs for painting it. It was fully cleaned and conserved in 2007 by the Chicago Conservation Center in association with the Chicago Park District. As Chicago grew from a cow town to a metropolis, streets and buildings were raised up out of the mud. 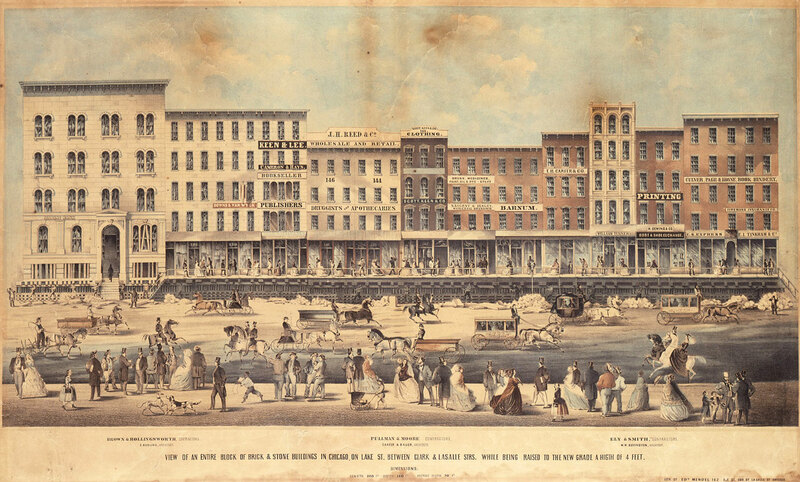 Click for full-size image to see the men on jackscrews raising an entire block of Lake Street in 1855 while business as usual continues. The top floor of the Allerton Hotel on North Michigan Avenue at Huron Street once housed the Tip Top Tap, a swanky nightclub. If you look at the top of the Allerton today you'll see a "ghost sign" for the club even though it closed in the 1960s.